I guess this cold weather, the coldest February that many of us can remember, is going to stick around for another week or so. So perhaps it is time to get that oven going? Time to try some pancake, muffin, or waffle recipes that you may have saved but never made.. but that look good! Mini German filled pancakes from realmomkitchen.com . 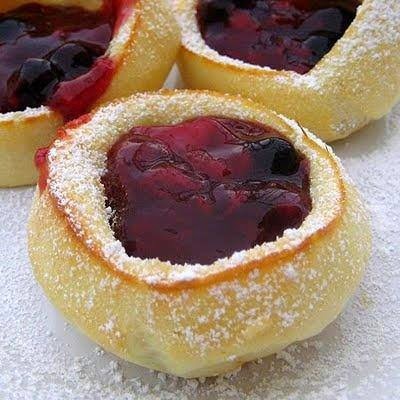 Mini German pancakes in muffin tins with fillings.. Don't these look delicious? And the recipe is easy as well! From realmomkitchen.com, adapted by Bling. Depending on the size of your muffin tin, this recipe yields 12-18 muffins. Blend in the melted butter a little at a time. Bake for 15 minutes, or until puffy and golden on top. The crater will form on its own. Add your favorite toppings. (See below for some ideas). And a dusting of powdered sugar. In the U.S., unless the recipe calls for a specific flour, all purpose (general use) is used. "A common problem is that people tend to blend the eggs too fast or too much. A nice easy blend is key." OK! "Blueberries and powdered sugar are great fillings!" I can imagine. "Blend however you'd like. By hand, hand-mixer, etc. Just don't over beat the ingredients." But someone else insists: "Yes, you have to make them in the blender. Trust me, I've tried doing it by hand and they don't turn out." Celsius oven? 180 degrees Celsius at 10 minutes. "I put a cream cheese/whipped cream mix into the craters. Then I top with homemade strawberry jam. Chill. Then serve." Sounds more like a dessert, but good! "Put a scoop of ice cream in the crater and top with strawberries and whipped cream." Yes! Definitely dessert! "I make this in a 13 by 9 glass baking dish and serve it with a buttermilk syrup. Good German Pancake or Dutch baby Cakes." "It should taste EGG-y and RICH! The original was smothered in powdered sugar with fresh lemon wedges to squeeze generously over the crispy-on-the-outside gooey-on-the-inside powdery sugared cake. I'm not any kind of a cook but am a professional eater! If you change the recipe to make them into regular pancakes well then you've got regular pancakes." But someone suggested that "if there are lumps of flour left or you overfill the muffin cups, it will not form a crater". Now here's a real breakfast idea: "Great to fill with scrambled eggs and sausage pieces." Along the same line, someone suggested "Fried or poached egg with pancetta or bacon would be good." Yes, I think it would be. Or lunch! "Creamed chicken or tuna, just like mom used to make!" "I just made these and filled some with raspberry jam and some with fresh strawberries and they are really yummy." A variation on the lemon filling: "Great with butter, fresh lemon squeezed along with powdered sugar." Some other ideas: "I just made them, but I used a mini muffin tin. They look just like the picture. I topped mine with peach and raspberry preserves. Very tasty. Hubby approves too! Almost more of an egg tart than a pancake. Would be delicious with some bacon bits and cheese on top too. Could even possibly blend some onions and peppers right into the batter." Someone suggested that they only should be in the oven for 12-13 minutes. "It is a soupy batter but doesn't end up soupy. That's how German pancakes are made." "I do a large version. For every egg use 1/4 cup flour and milk. I bake in a pie plate. I melt 1-2 tbsp butter in pan and add 3/4 cups batter and bake at 425 until set and golden or slightly browned. We sprinkle lemon juice and powered sugar on them the way they are served in restaurants. They don't need sugar in the batter. I do 6 eggs at a time.I bake the above recipe for usually no more than 15 mins, best to go by how they look, some of us like them softer and some drier; they will puff up and look like a bowl." So... Try the recipe as printed at the top and see what you think! Then try an alternate version if you dare.